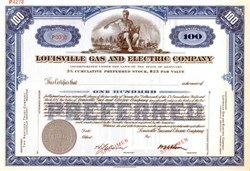 Beautifully engraved SPECIMEN certificate from the Louisville Gas and Electric Company. 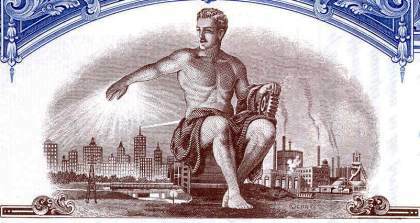 This historic document was printed by the Columbian Banknote Company in the 1940's and has an ornate border around it with a vignette of an allegorical man infront of a city skyline. This item has the printed signatures of the Company�s President and Secretary. Louisville Gas and Electric Company is an electricity and gas utility based in Louisville, Kentucky, serving customers in Louisville and sixteen surrounding counties.